If you can't wait until the Bowles Center opens to read one of these, ask a librarian (or check our libary catalog) to see if a copy is already owned by the Library. 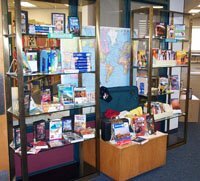 We recently added many new travel titles to the Main Library, thanks to funds from the Friends of the Library. Some of the series include Lonely Planet, Let's Go...; Rick Steves, DK Eyewitness, Frommer's, Fodor's, and more. Destinations are both domestic and international. Some of these books are on display near the Circulation Desk, but we ran out of display space before we ran out of books, so ask a librarian if you don't see the book you need. The Main Library has received a temporary collection of Large Print Books and Audiobooks (books-on-tape) from the North East Texas Library System. What does this mean to you? Until early August, you can check out a "new" large print book or audiobook that we don't normally have in our collection. Large print: Scenarios, by Bill Pronzini; Shroud, by John Banville; Hark! by Ed McBain; When We Touch, by Shannon Drake; The Journals of Eleanor Druse, by Stephen King; Candyland, by Ed McBain as Evan Hunter; In Siberia by Colin Thubron; and Helen of Troy, by Amanda Elyot. Audiobooks: A Death in the Family, by James Agee; Cape Refuge, by Teri Blackstock; Angel Fire East, by Terry Brooks; Edge, by Catherine Coulter; Sticks and Scones, by Diane Mott Davidson; Puppet, by Joy Fielding; Foul Matter, by Martha Grimes; Hear No Evil, by James Grippando; Rosewood Casket, by Sharon McCrumb. This list is not complete. Large print books are shelved on the New Book shelf. Audiobooks are on the top of the first audiobook shelf.